1. Heat the oil in a wok over a high heat. Add the onion and cook for 3-4 mins until softened and slightly caramelised. Add the garlic and stir for 1 min. 2. Add chicken and chilli powder. Stir fry until it cooked. 3. Toss in the carrot and, then cook for 1-2 mins. Add the rice and stir to warm through. Pour in the fish sauce, soy sauce and some seasoning. Make a well in the centre of the wok and crack in the egg. Fry until the white is nearly set. 4. 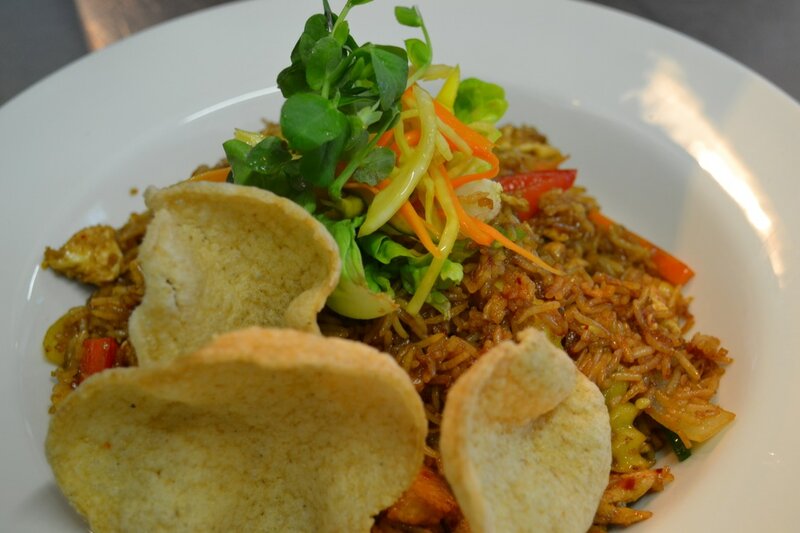 Serve the rice in a large bowl, topped with mixed vegetables prickle, prawn crackers and drizzled with chilli sauce. And, enjoy.